With more than 10 million residents, Los Angeles (LA) County is the most populous county in the United States. Its government—which consists of 37 departments; approximately 200 committees and commissions; and more than 500 political districts such as school boards, water districts, and sanitation boards—is responsible for delivering a wide variety of programs and services to residents and visitors. These include law enforcement, property assessment, public health protection, social services, parks and recreation, and cultural activities. Los Angeles (LA) County is implementing ArcGIS Indoors to solve its “last mile” issue: after people get to a building, how they figure out where to go once they’re inside. LA County operates and maintains approximately 4,000 facilities. This asset portfolio is more extensive in both quantity and value, as well as more diverse in terms of building types and facilities owned and operated, than most agencies. That makes it an ideal testing ground for Esri’s new indoor mapping system ArcGIS Indoors. The Internal Services Department (ISD) at LA County plays an important role in providing a range of support services to other county departments in the areas of purchasing, contracting, facilities, information technology, energy and environmental programs management, parking, and mail services. To keep county facilities and technology running smoothly, ISD staff are regularly deployed across this highly distributed workplace, which spans over 4,000 square miles, to help out and collaborate with the county’s more than 100,000 employees. 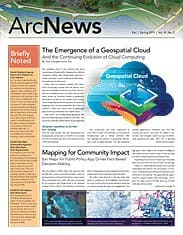 Within ISD, the enterprise GIS team supports the authoritative geospatial information that underpins countywide operations, decision-making, and public services. LA County was Esri’s twentieth customer, so GIS-based mapping of the outside world has a long history there. Mapping, managing, and navigating interior spaces, however, present their own unique challenges and opportunities. But LA County’s geographic information officer (GIO), Dr. Steve Steinberg, sees this as a moment of transformation. After searching for where they need to go, users will receive landmark-based directions in a side panel of the app that navigate them around recognizable building features such as staircases and conference rooms. “Currently, county staff responding to a wide variety of both maintenance and technical service requests across hundreds of buildings can find it difficult to locate a specific room,” Steinberg said. 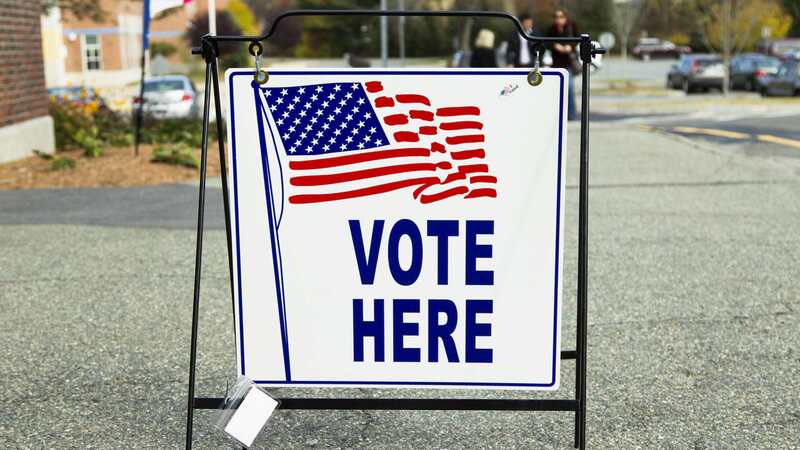 The public faces similar challenges when looking for the correct office or counter to access county services, which range from applying for a permit or paying a bill to attending a public meeting or getting a flu shot. To engage effectively with county staff and community stakeholders, Steinberg and his team wanted to explore new and innovative solutions that would make it easier for them to accomplish their objectives. As the GIO for the county, Steinberg believes that there is tremendous opportunity to proactively leverage emerging technologies that will provide even more efficient and effective government services. 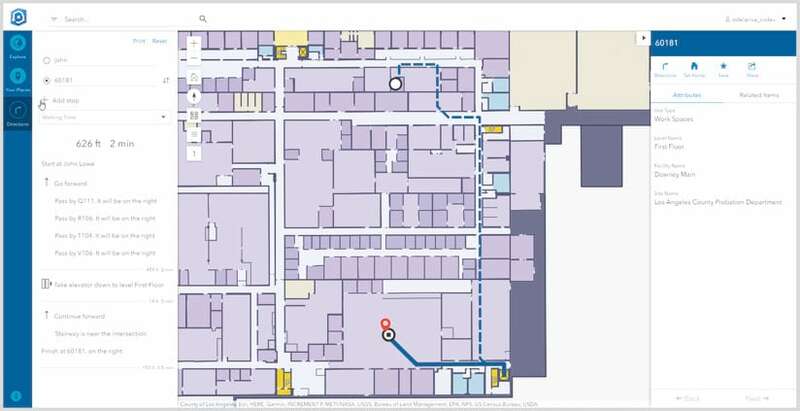 Indoor mapping has the potential to develop more effective maintenance programs, improve how space is utilized, provide navigation options that are compliant with the American Disabilities Act, and furnish better services to county employees and the public going forward. That’s why Steinberg is leading LA County’s initiative to beta test Indoors. Most people know how to use their phone to navigate to the correct building. What we face now is a “last mile” issue: how to find where to go after walking into the lobby of a facility. Indoors offers off-the-shelf apps for workplace operations, planning, and wayfinding that are accessible via the web, mobile devices, and kiosks or digital signs. With easy indoor navigation available across every device, the workforce and visitors have complete mobility across familiar and unfamiliar workplaces. 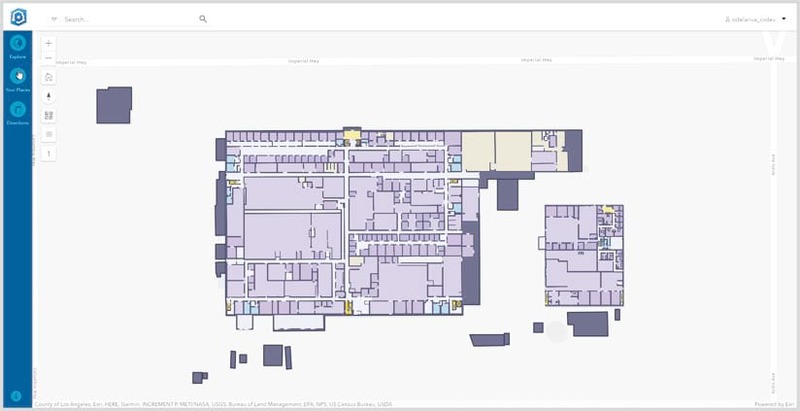 Indoors also comes with an add-in to ArcGIS Pro that enables organizations to create and manage indoor maps from CAD or building information modeling (BIM) software and allows them to keep these constantly changing indoor maps up-to-date. 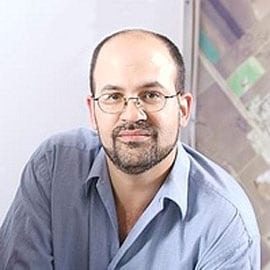 As early adopters of Indoors, Steinberg and his team are keen to use this new geospatial technology to make county workplaces more accessible to constituents, more functional for employees, and easier to service. Citizens who are looking for county-facilitated programs, services, or meetings are typically lost the moment they enter an unfamiliar LA County building. When Indoors is fully implemented, however, citizens in the LA area will be able to search for their events, services, and county officials using a map that’s accessible in two ways: on their individual mobile devices via the web or a native app or on public-facing kiosks located in the lobbies of county buildings. 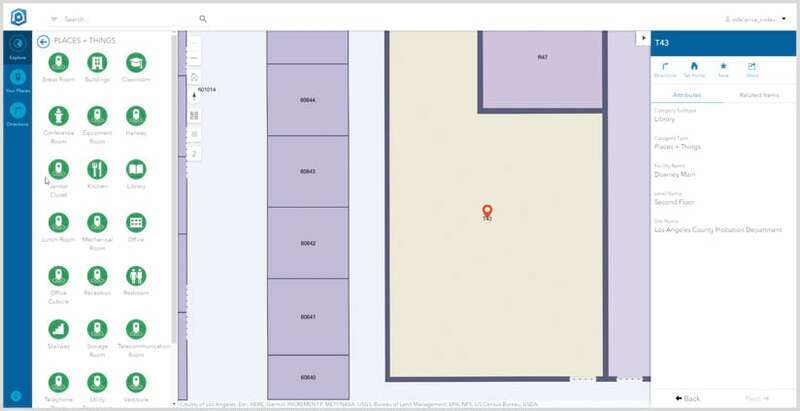 Once people search for what they need—an amenity, a room, a service, or a person—on their preferred device, landmark-based directions to the nearest result will be returned in a side panel that navigates visitors around recognizable building features such as staircases, conference rooms, and water coolers. As an early adopter of Indoors, LA County is exploring opportunities to deliver a comprehensive workplace map to everyone who uses its spaces. County employees will receive a more detailed map of the workplace that gives visibility into additional infrastructure such as private or secure offices, tech closets, electrical and plumbing shutoffs, and other spaces necessary for maintenance and planning purposes. The county’s ISD field technicians and dispatchers will likely have comprehensive maps that include the ability to see dozens of workplace layers, live updates to service requests, and the real-time locations of operators and contractors. Under Steinberg’s guidance, LA County’s ISD is piloting Indoors with the goal of transforming its workplace. As an early adopter of the technology, the county is exploring opportunities to deliver a comprehensive workplace map to everyone who uses its spaces via functional, off-the-shelf apps. People will finally know where to go, regardless of who they are or what building they’re in, making LA County much more accessible.